Saturday night in a pub in South London and I’m drinking a pint of Youngs Bitter with my friends. It’s the first beer I’ve ever bought in a pub, because now I’m eighteen and it’s legal for me to drink in public. But not everybody is drinking pints of draught beer, for an older character who stands in a corner at the end of the bar has just ordered a bottle. Not an ordinary bottle either, because it is tiny; and the contents are poured by the barman into a small goblet, not a normal straight-sided glass. I thought it must be some kind of exotic spirit, which would be weird because we didn’t do exotic in South London in those days. When the barman came our way, I asked him what this mysterious fluid could be. He told me it was a sort of strong beer, which was why it came in a small bottle, known as a “nip” containing only a third of a pint, and that it was called a barleywine. “What on earth is a barleywine?” I said to my friends, but none of them knew. I found out eventually, but it took some time, for we lads didn’t want to be seen in public with an old man’s drink. Even when I did finally try it my then untutored palate couldn’t handle it, and it remained “exotic” to me for quite a while. It wasn’t what you would call highly popular, and indeed not all breweries had a barleywine in their portfolio. All those I came across were served only in nips, and never on draught. It was a somewhat elusive brew, for not all pubs stocked it; those that did often brought it in from another brewer. And when I became interested in defining beer styles and in delving into the history of them, I found barleywine to still be elusive. There is a reference to “barley wine” being brewed in Armenia in the Fourth Century, and the term “malt wine” was in use in Britain in the Eighteenth Century. “Barley wine” surfaced again in the early 1800’s, but it appears only to have been a marketing tool in beer’s fight against the encroachment of wine on the British dining scene. The term seems to have come into vogue as a style descriptor only in the early Twentieth Century, though referring as it did to all beers above about 8% ABV, it was pretty much a catch-all term. 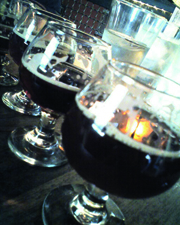 It included pale and dark beers, which could be highly-hopped, low-hopped, malty and sweet, dry and bitter, or anything in between. Of course, the same could be said for our modern style guidelines. The reason for this broad definition was that barleywines were direct descendants of the strong ales that had been around for centuries. Indeed, in the Eighteenth Century the “strong” would have been a redundant term for all ale was strong. Anything else was either small beer, or porter. This came out of the process of brewing used in those days, when sparging was not practiced and it was common to use two or three mashes of the same batch of malt. The first, high-gravity runnings were taken for ale, and subsequent runnings of wort became the small beers at much lower gravity. Sometimes, the brewer might use an extra amount of malt, so that the ale was even stronger, in which case it might be called October Ale, or Stingo, Chancellor Ale (which I wrote about in the May-June 2006 issue of BYO) or have a regional designation, such as Dorchester Ale, Nottingham Ale, or Welsh Ale. In those days it was common for the great houses of the gentry to have their own brewhouse, and to make their own beer to satisfy the needs of both the lord (or squire}, and the army of staff needed to run the premises. Of course, the staff got the small beer and the master the ale, which would be kept in cask one or two years, and then drunk in small amounts, as we would drink a liqueur today. They would use special glasses, often of fancy design, and frequently etched with barley and hop motifs, and able to contain little more than a few mouthfuls of the beer. As Britain moved into the Nineteenth Century, private brewing declined, and the tastes of everyday drinkers turned to “running” beers, that is those that were not long-stored, but rather drunk within a few weeks of brewing. Partly because of this, and partly because the hydrometer gave brewers a way of measuring strength, ale alcohol levels declined. And as the pale, bitter IPAs became ever more popular, sweet, strong beers became much less common. Strong ales received a further blow in 1880 when beer tax began to be applied on the basis of the beer’s original gravity, and they became ever more expensive. Perhaps what saved them from extinction was the fact that bottling of beers became more widespread about this time. This, coupled with the adoption of the barleywine label gave these beers a clearer identity and established them as a niche market. Some of them still survive in Britain’s session-beer dominated market today, such as Orkney Skull Splitter, Fuller’s Vintage Ale, and both Thomas Hardy Ale and Gale’s Prize Old Ale also fit this style. And of course there are some brewed here at US micros, such as Rogue’s Old Crustacean, Smuttynose Barleywine Style Ale and Sierra Nevada Bigfoot Barleywine Style Ale. Which brings us to the question of specifications for the style, and that is just where that old elusiveness shows up again. The Beer Judge Certification Program (BJCP) gives an ABV of 8.4–12.0%, but a number of English barleywines are brewed down to 7%. And, even odder is that fact that I have seen Samuel Adams Utopias (25% ABV) and Millennium (20%) called barleywines. Add to this the fact that the BJCP lists two separate versions, namely English and American, which differ primarily in bitterness levels, then pile on that the BJCP style guidelines for imperial, or double IPA substantially overlap those for barleywine, and we can see that there is no definition that is universally agreed upon or that cleanly separates barleywine from similar styles of beer. The first question to answer for an all-grain brewer is how much do I want to make? That’s because the size of your mash tun is the crucial factor with a beer that requires so much malt. If your set-up is for brewing 5.0 gallons (19 L) of “normal” beer, you won’t be able to make much more than 2–3 gallons (7.6–11 L) of barleywine. For example (using the BYO standard yield), to make 5.0 gallons (19 L) of wort at OG 1.100 your mash tun would need to hold 21 lb. (9.5 kg) of pale malt, plus up to 30 qt. (28 L) of water. That would not fit into my mash tun, so I generally make only 3.0 gallons (11 L) of this beer, and I recommend that you make a careful check of your mash tun capacity before you start. You can, of course, make this beer by the time-honored procedure of using only the first high-gravity runnings from the mash. This works in commercial breweries, but may not in a home brewery unless you have a mash tun large enough to yield sufficient pre-boil wort. However, if you want to make the beer as pale as possible, this is a better way than the next procedure. My normal approach is to simply run-off, sparge and boil the whole wort, as for a normal beer. This is straightforward in both procedure and in the calculations needed to hit target gravity, but can be tedious depending upon what OG you are aiming for, and on what rate of evaporation you achieve in the boil. A downside of this approach is that the beer will be at the darker end of the color specification; but a plus is that it will be well-caramelized, an important flavor characteristic in barleywine. A variation on this procedure, which requires less boiling, is to boil until you have an SG of, say 1.070, and add malt extract to bring it up to the final gravity, followed by a short boil. By far the simplest approach to brewing these big beers is to extract brew, because you can reach target gravity without long boiling this way. Further, if you hold back one-half to one-third of the extract and add it towards the end of the boil, you can achieve adequate hop utilization when boiling less than the full volume of wort. A short boil can be a problem though; because the beer will have less caramel flavor. So you might want to consider using some specialty grains, such as crystal malt or Special B.
Classically, strong ales were made using only pale malt, and all-grain brewers will get good results doing the same. Two-row pale malt is best, and either US or British can be used. You may add specialty malts such as crystal, Munich, Victory and so on, but it is debatable whether you will gain much from doing so. With so much malt there already, plus the colors and flavors developed during boiling, I would argue that you get as much flavor as you can handle, without looking for something extra by adding other malts. As I intimated above, the reverse may be true in extract brewing, and you may well want to use up to a pound of crystal malt (infused in the usual way) for a three-gallon brew. You might also use a longer than normal boil, say 1.5–2 hours, so as to generate more caramel; be careful though, as this can result in a thinner-tasting beer. If you want the beer to be at the darker end of the range, amber extract may be your choice, whereas if you want to brew the lighter-colored version, then pale extract will be required. You can use all kinds of hops in these brews, depending on your taste. Traditional barleywines would use English hops, such as Fuggles, Goldings, First Gold or Target. If you want to go for something more American, then Cascade, Chinook, or my favorite, Amarillo would be more appropriate. Of course, in the current climate, you may have to substitute for these. For bittering go for the higher alpha-acid varieties, so that you use less and therefore lose less of your expensive high-gravity wort in the trub. Also note that most commercial barleywines use a calculated figure for IBU, rather than an analytical one. And I am doubtful that it is possible to achieve 100 IBU at OG 1.100, because of solubility limits; however, I have not actually seen any published results on this. Further, perceived bitterness in such a big beer will very much depend on the final gravity (FG). If you want hop aroma and flavor, you can achieve this in the normal manner by late or post-boil additions. A slightly different flavor will be obtained if you dry-hop in the fermenter, but this is often the best way to get hop character into the beer; Amarillo, or perhaps Columbus should work well in this. Whichever way you go, reckon on adding up to twice the amount you might normally use, or the flavor can easily get lost in all the maltiness. A good level of attenuation is everything in the successful brewing of barleywine; if you can’t achieve that, all you will have is alcoholic syrup. At the lower end of the OG range, a good ale yeast such as the Whitbread strain, or even an Irish ale yeast can be made to work well. For higher starting gravities, a yeast strain specifically selected to handle them, such as White Labs WLP007 (Dry English Ale) yeast is preferable, but I have had best results with Trappist ale yeast, such as White Labs WLP500 (Trappist Ale) or Wyeast 1214 (Belgian Ale) yeast. If you are seeking to avoid fruity esters, as much as is possible in a high-gravity ale, White Labs WLP001 (California Ale), Wyeast 1056 (American Ale) or Safale US-05 yeast is a good choice. When pitching, pour off most of the liquid from the starter and add to the wort, which should be thoroughly oxygenated for 3–4 minutes. Pitching is probably best done when the wort is at 70–75 °F (21–24 °C), which is a good temperature to maintain throughout fermentation to ensure high attenuation. If this results in some ester formation, it does not matter, for that will be just a little more variety in an already complex beer. Give the beer a secondary fermentation for up to a month before bottling, and make sure that fermentation has ceased before doing so. Ideally, after secondary keep it in a stainless steel soda keg and either serve it from there, or carbonate it in the keg then bottle it, using a counter-pressure filler. If you don’t carbonate it this way, don’t prime before bottling, but add some fresh yeast, bearing in mind that there may be little extra fermentation, and the beer may be under-carbonated. The very elusiveness of this style gives you lots of opportunity to experiment. Barleywine is not an easy beer to brew, but if you do it well you will be rewarded. Because it is so high in alcohol you’ll sip it rather than drink it and as you do you will enjoy its warmth and complexity. Keep some bottles aside and taste one or two each year over a period, and see just how it changes with time. It is not a beer you will produce often, but it makes a very good once a year special. Mash in at 148–150 °F (64–65.6 °C), using about 1.2–1.4 quarts (4.5–5.3 L) of water per pound of grain. After 90 minutes, run off the first 2.0 gallons (7.6 L) and set aside; these should have an SG of 1.070–1.080 (17.1–19.3 °P). Sparge to collect a further 4–5 gallons (15–19 L), but no more. Measure the total volume and SG of the second wort. Calculate total gravity by multiplying the volume of each wort times its gravity (in “gravity points” (GP) — that is 1.080 = 80 GP) then add these two numbers. Divide this by 84, and you will have the final volume you need in order to have OG of 1.084 (20.4 °P). Take the second wort and boil until the SG is around 1.060–1.070 (14.7–77.1 °P), then add the first wort. Boil vigorously for 1 hour or so, add the Magnum hops and boil for another hour or so, or until you have reached the desired final volume. Add the Irish moss 10–20 minutes before the end of the boil. As you turn off the heat, add the finishing Fuggles hops; adjust the volume with cold, sterile water if required. Cool to no less than 70 °F (21 °C), and pitch with the yeast starter, as described above; don’t forget to oxygenate for 3–4 minutes after pitching. When primary fermentation appears to be complete, rack the beer to a secondary fermenter. Rack again after 2–3 weeks, preferably into a stainless steel soda keg, and leave to mature in a cool dark place. If you want to bottle the beer, this is best done by means of a counter-pressure filler. You don’t want to add priming sugar to the bottles, as there may still be a slow fermentation taking place. Over a maturation period of a year or so this can result in very high bottle pressures. Heat 0.5 gallons (1.9 L) water to around 170 °F (77 °C), and add the crystal malt; keep at this temperature for 30 minutes, then strain out the grains. Add water to a total of 3.5 gallons (13 L) and carefully dissolve 4.0 lb. (1.8 kg) of the malt extract, bring to a boil and add the bittering hops. After 1 hour, turn off the heat and very carefully dissolve the remainder of the malt extract. Then turn on the heat and boil for a final 15 minutes, adding Irish moss for the last 10 minutes, and the flavor hops when you turn off the heat. Cool wort and transfer to fermenter. Aerate wort and pitch yeast from yeast starter(s). Ferment and mature as described in the all-grain recipe. Add the dry hops to the secondary, using a sterilized, weighted muslin bag, and remove on racking to the stainless steel keg, proceeding from there as above for maturation. Here’s a 5.0-gallon (19-L) big barleywine recipe that doesn’t require a huge mash tun or an extremely extended boil. (19 L). Add dried malt extract with 30 minutes left in boil. Add hops according to the schedule given in the recipe. Add Irish moss with 15 minutes remaining in the boil. After the boil, chill the wort to 68 °F (20 °C), aerate well and pitch sediment from yeast starter. Let ferment at 68 °F (20 °C). Rack to secondary, add sugar and yeast nutrient and let sit for two weeks at 65–68 °F (18–20 °C). If possible, bulk condition at 40–45 °F (4.4–7.2 °C) for two to three months. Bottle or keg, minimizing any splashing or other aeration of the beer.